If you are in Panther Creek, you’ll want to look into membership at the best country club in the area—Panther Creek Country Club. This fantastic club has everything that you need to relax, unwind and have a good time. Your first stop when touring the club should definitely be their magnificent golf course. This course was designed by PGA Hall of Famer Hale Irwin, and is a picturesque course. There is also an excellent golf range where you can work on your swing. If you are looking to stay fit, take a swim in their pool or visit the fitness center that is open 7 days a week. There’s even a children’s splash pool and wading pool for your kids to get some exercise and cool off in the hotter months. 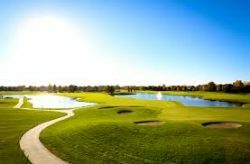 If you are looking for everything from delicious dining to challenging rounds of golf, you’ll want to consider joining Panther Creek Country Club. Booking Howl2GO Dueling Pianos’ world class show to your Springfield, IL event couldn’t be simpler. From conventions to corporate events, weddings to fundraisers, our unbeatable Dueling Piano shows bring a high energy, interactive show that your guests will remember for years to come anywhere in Illinois!